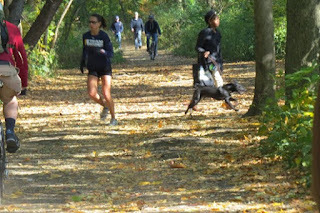 NYC Parks after a lot of pressure from many activists put plans on hold for a planned paving of the Putnam Trail which was supposed to take effect on 2013. However, an article in The Riverdale Press indicates that they are still pressing on despite the many solid arguments that putting a blacktop in that area would have negative effects to the surrounding wetlands. Here is the deal, I am not engineer to tell you whether this plan is going to work well with the surrounding area -- I don't know. What I will say, is that any disturbance to an area that has become a home to wildlife is never a good thing. And we are supposed to be protecting these last vestiges of habitat in our City...right? Having seen nesting Red-bellied Woodpeckers, Downy Woodpeckers, Blue-gray Gnatcatchers, Baltimore Orioles and Yellow Warblers all along the trail while leading bird walks in the park, it saddens me to think that they will all be forced to move and maybe lost to those who enjoyed their presence. The folks advocating the paving have presented plans with promises of planting trees to replace the ones that are taken down but what these "experts" don't tell you is that saplings cannot replace old growth or dead trees used by cavity nesting birds like Woodpeckers or Screech Owls...which I have seen along the trail. They have used the argument that the paving of the trail as being critical to access by folks with strollers, cyclists and wheel chair users. That is fine but what opponents to the paving have proposed is an alternative to the use of pavement that seems viable with less impact. If you want to learn more, visit the Save The Putnam Trail website, which has lots of information on the planned paving and the possible impact.